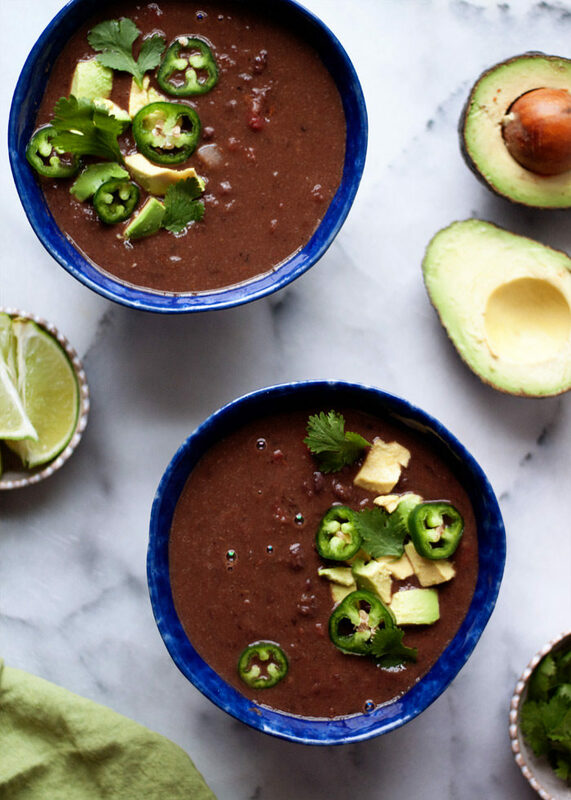 Creamy black beans pureed with cumin, jalapeno, and lime … yum. This super-easy soup is so simple to put together, you’ll want it in your weeknight dinner rotation forevermore. 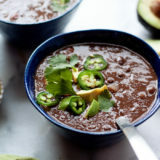 This black bean soup recipe – our very favorite of all black bean soup recipes – is flavored boldly with cumin, spiced up with a bit of jalapeno, and topped off with a squeeze of lime. It’s the perfect comforting, hearty dinner for any time of year, but we love it in the still of winter. Comfort in a bowl! It’s one of those accidentally-vegan recipes – one that everyone will love, regardless of its meatless, dairy-less status. Perfect for feeding mixed-diet folks. One of the things I like best about this recipe is that it makes a pretty large amount. I like to freeze half of it for an easy meal down the road. Just let it cool completely, ladle into a gallon-size freezer bag, label, and freeze flat. Voila! Instant future dinner. Set a large pot over medium heat. When hot, add the olive oil. Add the onion and oregano and saute, stirring occasionally, until the onion is translucent, about 5 minutes. Add the garlic and saute, stirring occasionally, for another minute. Add the cumin, pepper, beans, tomatoes, vegetable broth, 1/2 teaspoon salt, and 1/8 teaspoon pepper. If using whole tomatoes, break them up with a spoon. Increase heat to high to bring to a boil, then lower heat to a simmer. Cook uncovered until thickened, about 25 minutes. Remove from heat and let cool until safe to handle. Transfer 6 cups to a blender and puree. Return to soup and stir to combine. (You can also remove 6 cups from the soup and use an immersion blender to puree that half of the soup, if you prefer). Return to medium heat until reheated throughout. Add lime juice. Taste and add additional salt and pepper if desired. Can you “crock-pot” this recipe? I was excited about your recipe until you referred to the beans as being “ugly”..that doesn’t make sense to me. Beans are beans..you made them seem so unappealing. 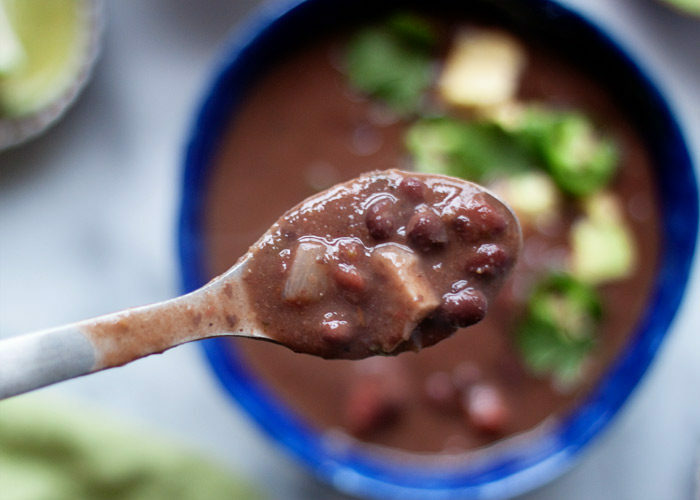 Black beans are a staple in Latin cuisine. This soup has quickly become a favorite at our house! The flavors are incredible and so quick to whip up thanks to my handy immersable blender! Thank you so much for this incredibly yummy & nutritious recipe!!! Everyone in my family loves this soup , and I cannot say that about very many dishes. 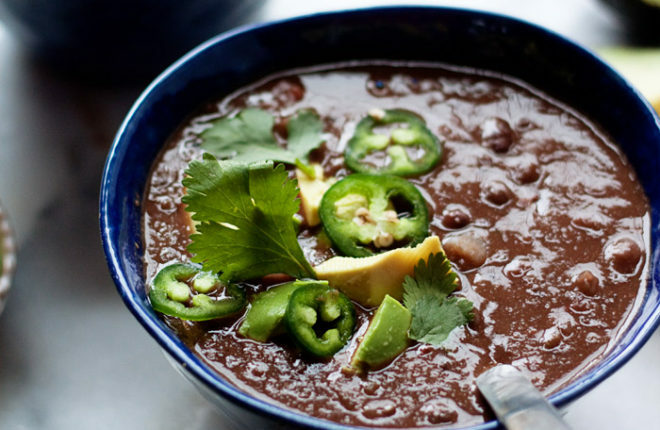 It reminds us of the black bean soup we loved on a trip to Puerto Rico. We have cilantro rice with the soup. Yummy! Oh my gosh, I need to try this with cilantro rice immediately. 🙂 Thank you Kristin! The soup turned out great! I served it with some fresh “spoonbread” or corn casserole to make it a full dinner. I was able to save about 4 sandwich baggies in the freezer- can’t wait to have the leftovers for a quick and easy lunch! 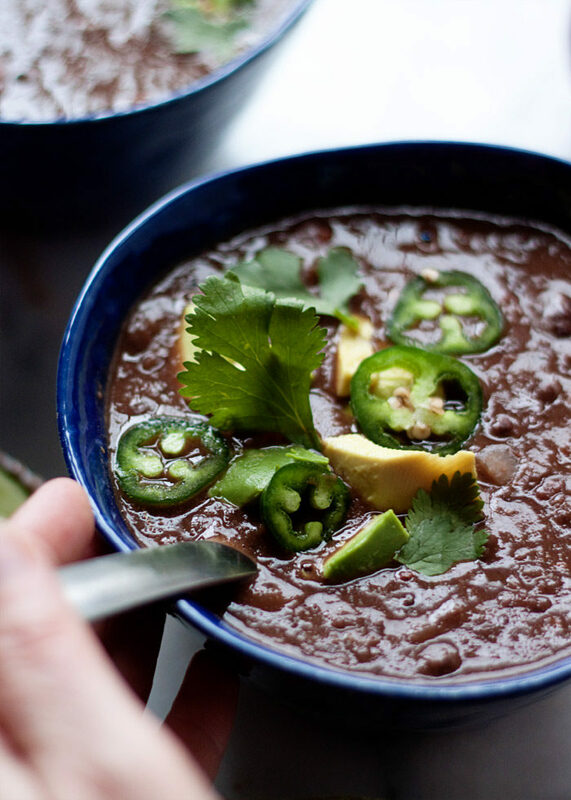 Made this black bean soup. It is the best so far. I did not add jalapeños, used beef broth instead of vegetable and added Chorizo and cheddar jack cheese. It was the best I’ve had so far. This was a wonderful soup! My boyfriend and I loved it and it will be a staple soup in our house! I had some leftover cooked quinoa and decided to throw it in right at the end, just to not be wasteful. It was great! I’m not a big fan of beans by themselves, but this ate more like a chili. Thanks! Made it today. My husband had two helpings and I got rave reviews. Thank you. I’m really excited to try this recipe, but I am counting my Macros and I was wondering what they were for this recipe? I was offended by your statement about Black Bean soup being ugly. I almost didn’t want to read further, but I decided not to be so sensitive. With the racial climate being what it is today, we have to be mindful with our words. Let me ask you a question , if it were a creamy yellow or white soup would it be more appealing? With that being said, I will give this recipe a try. FYI I know you were referring to food, but to me Black is beautiful! Thank you for saying so. I have a tendency toward self-deprecation and when I make comments like this sometimes I don’t think about the wider implications and how it might affect others. For what it’s worth in my opinion my ugliest recipe of all is a pale yellow-ish chickpea curry (but like this soup, it is delicious!) In both cases it’s more about the lack of vibrant color that can make dishes so aesthetically appealing. I’ve received a couple of comments about people who have been put off by this so I’m going to rewrite the intro. Thanks again for letting me know your thoughts; I truly appreciate it. Garlic listed as an ingredient, not mentioned in the instructions. It’s in there; see step 2.